Bitcoin's latest huge crash contains a pattern that could reveal a horrible secret about manipulation of the cryptocurrency. In the last week Bitcoin has lost 30 per cent of its value, again. Bitcoin FOMO is over. The digital currency, which earlier this month notched up a year of underperformance, has entered an ugly new phase. If you bought Bitcoin a year ago (at around US$8,000), and held on ever since, you have lost around 46 per cent of your money. 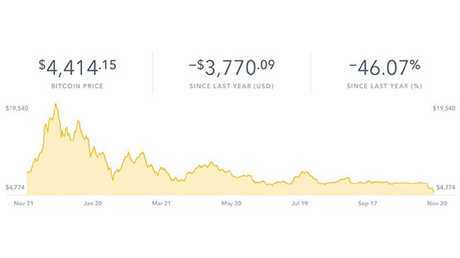 This next graph, from Coinbase, shows Bitcoin's performance over the past year - terribly exciting at first, then just terrible. 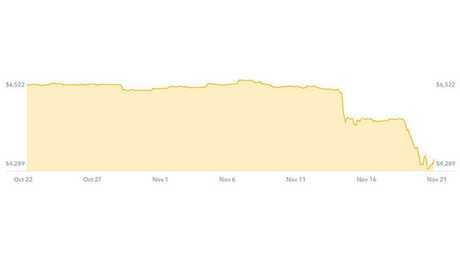 Bitcoin's price was crazy volatile a year ago. 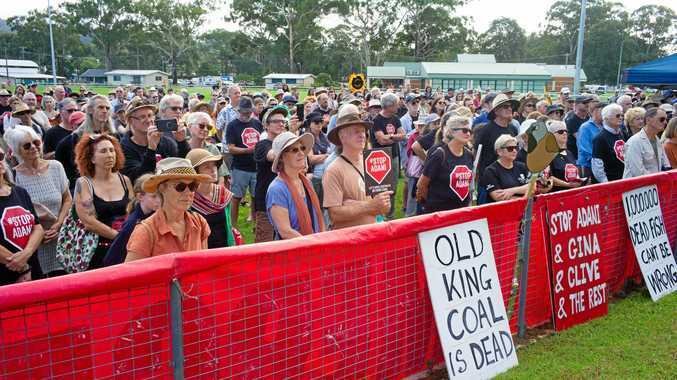 It surged to a huge peak just before Christmas 2017 and then spiralled uncontrollably down to hit a low by February. 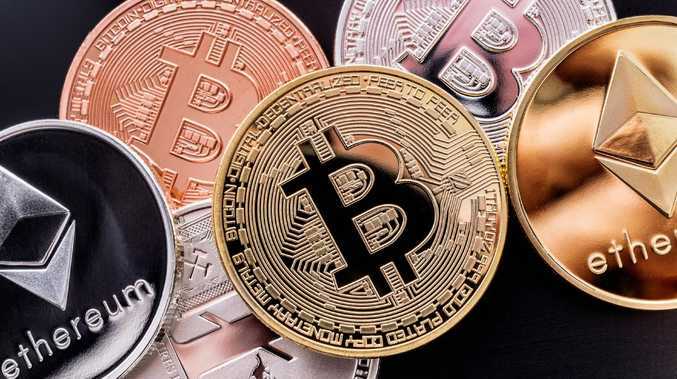 A period of very suspicious stability fell upon cryptocurrency markets in September. In September, October and November, as global markets roared and wept, Bitcoin showed about as much volatility as a rock. Almost every day it was trading between US$6200 and US$6600. The flatness was remarkable. The stability made Bitcoin boring. Until all of a sudden it wasn't. When that happened, the crash had a very peculiar shape about it that made me sit up and pay attention. I felt like I'd seen this before. It looked to me a lot like the collapse of a fixed currency, also known as a peg. 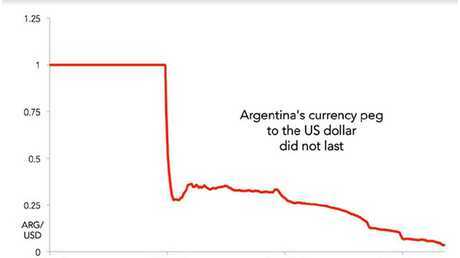 This next graph shows the exchange rate between Argentina and America, where the peg collapsed in 2002. A peg is where the exchange rate is set in concrete. Pegs were popular last century (the Australian dollar was pegged to the US dollar for a long time, for example) but countries learned you had to spend a lot of money to protect your currency. Pegs went out of fashion in most of the world. Although plenty of countries held on until their currency collapsed, like Argentina, and Thailand. When there is a peg in place we see stability. But it can be a facade. What we don't see is that behind the scenes, things are straining. 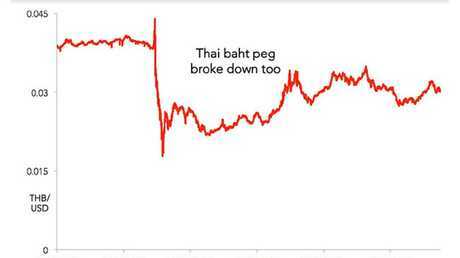 Here's a graph showing Thailand's exchange rate peg collapsing during the Asian financial crisis in 1997. Pegs can exist in national currencies because they have governments behind them. Those governments manipulate their value for various reasons. This is why seeing a "collapsed peg" pattern in Bitcoin is a surprise. Bitcoin doesn't have a government. Or at least it is not supposed to. Bitcoin is supposed to be an expression of collective free will in a system controlled only by the incorruptible mathematics of cryptography. The currency collapse pattern suggests Bitcoin may not be so free after all. Certainly, manipulation is well-established in crypto-markets, where wash trading (buying your own sale to create an artificial price level) is commonplace, and price manipulation bots run rampant. The recent stability was a mirage, it turned out. I certainly suspect Bitcoin was being manipulated during this period. Who was holding Bitcoin up? How? Why did they stop? Did they run out of money? We don't know. In the gambling movie Rounders, they say "If you can't spot the sucker in your first half-hour at the table, then you are the sucker." This may be good advice for anyone entering crypto markets. If you're not intending to commit manipulation, then manipulation is probably being perpetrated on you. That can work in your favour - many manipulators want to prop up the price. But you can never know when manipulation might stop.